For a quick review of the issue at hand, we’re asking . . .
Who is to be justly condemned, according to Paul in Romans 3:8? And why not do evil that good may come? — as some people slanderously charge us with saying. Their condemnation is just. Let’s examine this briefly from four angles: the original Greek text, various English translations, grammar, and logic. Using my I-don’t-know-much-about-Greek glasses, it looks as though the word “their” doesn’t really exist in some of the original writings, so maybe it was added for flow of thought. The sentence structure, no matter how you look at it, leaves things quite ambiguous. Compare reliable translations, and you will essentially come up with all three possibilities (#1, #2, & #3). Some translations attempt to answer the question, but it would seem that this is simply a liberty taken by the translators. As for the plain grammar of it, I personally think #1 makes the most sense. Now, to be sure, the other options make sense as well. Which is why I’m going to go with the fourth option. Let me explain my vote with three quick statements. 1. Answers #1 & #3 go together. So if #1 is true, #3 is also true, and vice versa. 2. All three possible answers are logical and biblical in the context of the passage. 3. The answer is unclear, so perhaps we shouldn’t seek to make it clear. I think our proper response to all of this is two-fold. Aim to know everything about the Word of God. And revel in the fact that, try as you might, you never will. Yeah, I guess all three options make some sense, and I didn’t really explain my view very much. I mostly just gave it lol. I guess I’ll try to explain it a little now. In the near context, it seems that what is being condemned is the false doctrine which some accuse Paul of teaching. Once that is answered, the “whose” question may be answered as well. It would be those people who were accusing Paul. Their condemnation of the false teaching is just although Paul points out that their accusations of him teaching it are slanderously inaccurate. Good point. 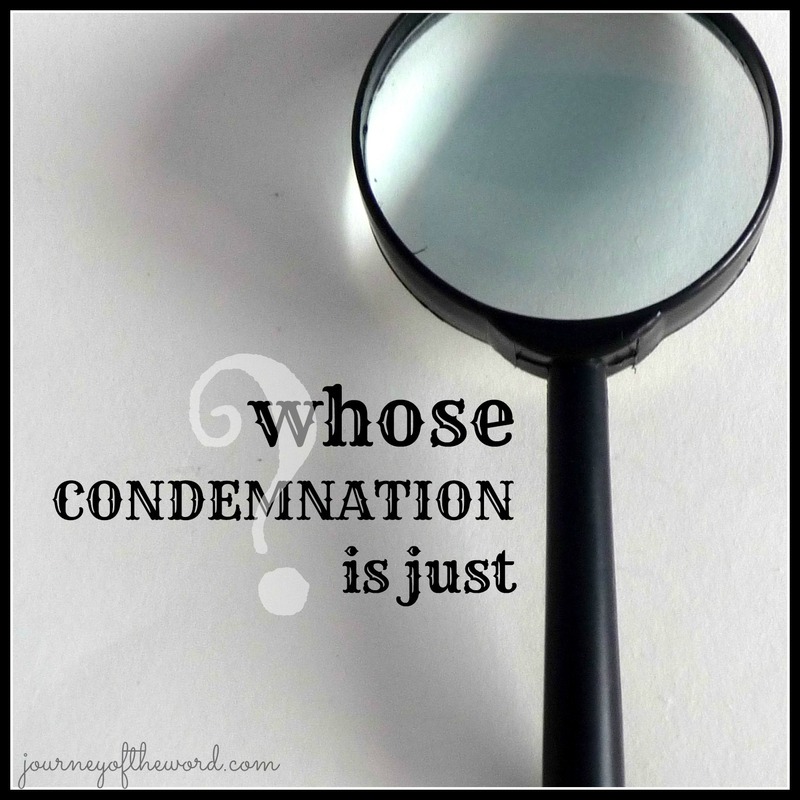 Yes, I guess I was really asking “What is the condemnation?” as well, though I certainly didn’t clarify that. I think I agree with your perspective there. Nice work.